DATIA: Arjun Singh of Datia, brother of Maharaja Bhawani Singh. bl.uk > Online Gallery Home	> Online exhibitions	> Asia, Pacific and Africa Collections	> DATIA: Arjun Singh of Datia, brother of Maharaja Bhawani Singh. 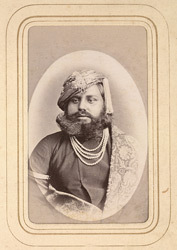 Portrait of Arjun Singh of Datia, brother of Maharaja Bhawani Singh from the 'Album of cartes de visite portraits of Indian rulers and notables' by Bourne and Shepherd, early 1870s. Datia, located in Madhya Pradesh, was controlled by the descendants of the Bundela Rajput family of Orcha from the start of the eighteenth century. Bhawani Singh (1846-1907) succeeded as Raja of Datia in 1857 but disturbances arose as Arjun Singh, an illegitimate son of the last chief and brother of Maharaja Bhawani Singh aspired to the throne. But he was suppressed by a British force and exiled to Benares.